Just when you think you have your business all figured out, you attned a conference only to discover you’re really uncool and not as knowledgeable as you thought! This was me at Blog World in Las Vegas last week. If I hadn’t had my MacBook I’d have felt like a total loser! I really enjoyed meeting the many people I follow and read regularly, plus the dozens who were new to me. What a great group of smart, friendly people. The event was fantastic, filled with panel discussions, workshops and keynotes by the thought leaders in our industry and I left with a ton of notes and a commitment to be more connected for my clients and me. Today I find myself scouring through my notes and starting to outline my plan of attack. In the event you’re doing the same, here’s a post I found today that I found very helpful in my follow up to Blog World. Sorry that I seemed to have fallen off the “ledge” but I also blog with my team over at Dishing With The Fish – it’s the bloggy stuff from all of us at Starfish P.R. Feel free to drop in there too! I don’t usually get weapy on the Ledge blog, but I am suffering from a broken heart today. 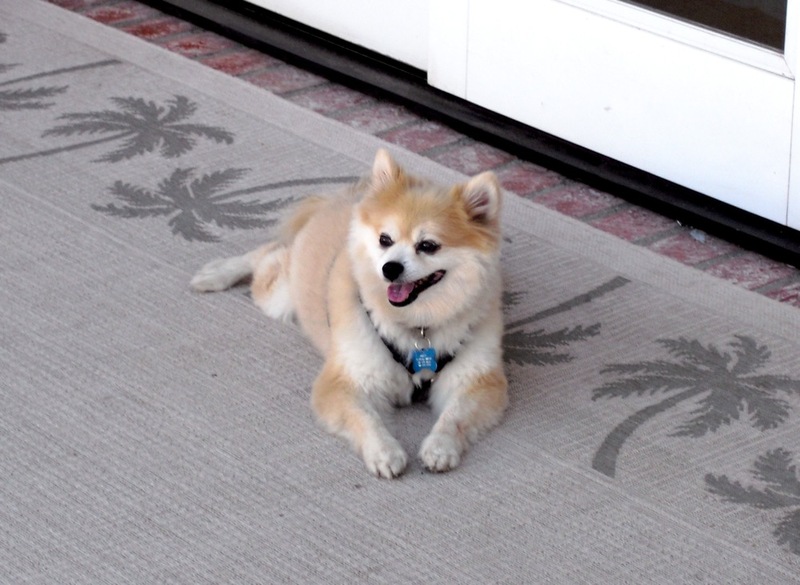 My beloved little Pomeranian rescue, Dusty, had to be put down today. It was devastating and I am going to miss him terribly. I am blogging about it for a couple of reaons, one is to help heal my broken heart and the other is to make sure the topic of adopting rescue dogs is out there. We adopted Dusty in March 2006 knowing full well he was at least 7 and there was no way to know his history. He had a bum leg and we came to discover he also had Tracheal Collapse, a common ailment in Poms. The leg never bugged him and the limp he had initially seemed to just disappear. The collapse was awful…always honking and spitting up, but he dealt with it. This week he went from normal to dismal in one day. His heart became enlarged and a lung filled with fluid, making it difficult for him to breathe. We spent our last day with him just showing how much we loved him and today we made that horrible trip to the vet. Thankfully, we have another little Pom rescue, which I actually did rescue from traffic, to love on and spoil. I am a rescue dog owner and always will be. I would not trade our 4 years with Dusty for anything. There are so many loving animals out there who need us and I encourage everyone to think Rescue first. Even if you want a specific breed, they are out there! Although, muts are super lovable, so don’t overlook them. Happy holidays and please, love on your pets this season and think rescue…always. It got me thinking about this. The client who wants a big article in a glossy mag or to be on Oprah (for the latter, you’d better rescue a small nation) wants to be on those platforms because they believe that’s where the majority of their customers will be and they want the biggest bang they can get. Interestingly enough, there’s a little thing called the Internet and your customers just happen to be there, a lot, every day, even the days Oprah is not broadcast. So, why not concentrate on the things you can control, which is not the glossy or Oprah, and create reasons for your customers to find you? You call it corn, we call it content! I love content! I am one of those dorky creative types who loves to create…well, anything! When someone needs to name their business, car, child or whatever, I love to help them figure one out! So with my over active brain and my Flip video, I now get to make content for my clients. Fun for me, great for the clients. We are no longer begging for attention, we are creating it ourselves, authentically, with the right messaging. They are not all winners, but they are all search results! My advice to anyone seeking publicity is to never poo poo a small publication that is not in your geographic area, because they are most likely online and that is your geographic area. Feedback that praises your company, no matter where they live, is helpful to someone who may be seeking out a service or product like yours. Using feedback from your current, happy customers, you can create videos, articles, how-tos, haikus – anything that will appeal to new customers. Go for it all, something will appeal to someone and if you do it right, they’ll share it with everyone! Yesterday, I had the privilege of attending the California Womens Conference in Long Beach, thanks to a last minute invitation from my friends at Habitat for Humanity of Greater LA. It was awesome and I’ve been thinking about the experience all day. It got me thinking about how much more I want to do and how I need to put it out into the universe so it can happen. I want to be able to travel the world and speak for a living. I want to inspire others and be inspired by those I meet. It would be a dream come true to make a living by speaking, sharing ideas and writing. And mentoring others would be icing on the cake. This may sound weird but every time I get a new legal pad to write on, it makes me feel so full of promise and possibilities, like it’s just waiting for me to fill it’s clean, white pages with all my fantastic thoughts and big ideas! That is how the Womens Conference made me feel and so now I must get to work on my new dreams! A good friend just sent me a great motivational email and this quote really spoke to me. Enjoy!